Today was our final winter discussion as we do Groundhog's Day, Valentine's Day, Dental Health, and President's Day in all of our eight classes in February. To top off that January flew by and today was short day because of a delayed opening. 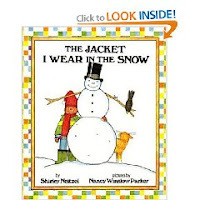 I also read, "The Jacket I Wear in the Snow," by Shirlely Neitzel, illustrated by Nancy Winslow Parker, because it mentions lots of different items one would wear outside. 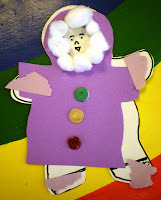 Our craft today was a person dressed to go outside. 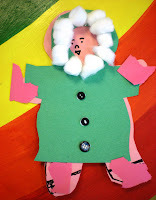 I had supplied the two main parts and the children added their options. I also decided since they were having trouble with ripping we would try that again. 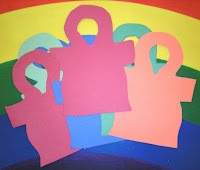 I gave each child a person shape I had previously cut out. 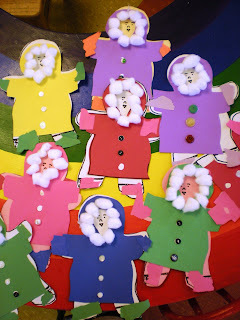 Then I let them pick a snowsuit to put on the person, I also had these cut out. Next I gave them some scrap paper and asked them to rip some pieces to use for boots and gloves. 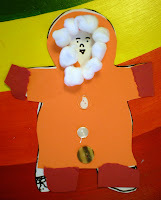 We then added some cotton ar ound the hood and some buttons. They're cute. 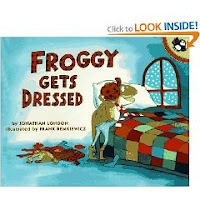 The story I read at the end of the day for fun was "Froggy Gets Dressed," by Jonathan London, illustrated by Frank Remkiewicz. 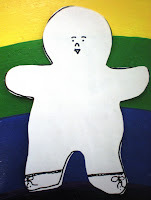 They love Froggy,oh and of course it talks about underwear--the funniest word in the world to a preschooler. It was a fun day.